Greece To Close Banks, Impose Capital Controls Amid Looming Default : The Two-Way Greek officials announced that they would close banks until July 6 in efforts to stanch a run on the euro. 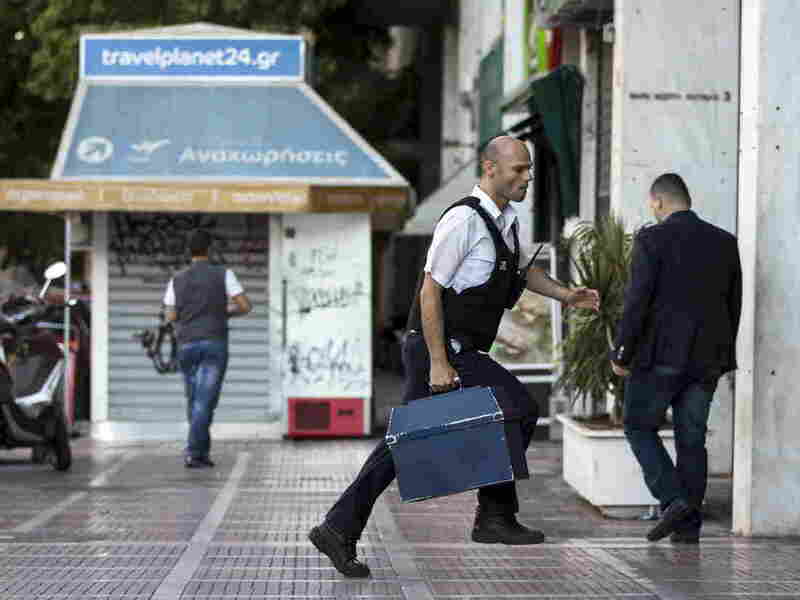 A security worker brings money to a National Bank branch in Athens on Sunday. Greeks have been withdrawing euros in anticipation of a possible default on the country's debt payments early next week. Greece's Prime Minister Alexis Tsipras announced Sunday that banks will be closed and capital controls imposed in order to stave off a run on the euro after negotiations with the country's international lenders broke down. He said the Athens stock market would also be closed. However, Tsipras blamed the European Central Bank for the latest crisis after it decided not to increase the amount of emergency liquidity amid a run on the banks that saw people lined up at ATMs, many of which ran dry amid the onslaught. "It is now more than clear that this decision has no other aim than to blackmail the will of the Greek people and prevent the smooth democratic process of the referendum," Tsipras said in a televised address to the Greek people, according to The Associated Press. "[Rejection] of the Greek government's request for a short extension of the program was an unprecedented act by European standards, questioning the right of a sovereign people to decide," he said. "This decision led the ECB today to limit the liquidity available to Greek banks and forced the Greek central bank to suggest a bank holiday and restrictions on bank withdrawals," Tsipras said, without elaborating on how long the bank holiday would continue. On Saturday, Tsipras called for a national referendum on July 5 to decide the fate of a bailout package hammered out in negotiations led by Germany, the home of the ECB and the grouping's strongest economy. Finance ministers with the European Union have rejected the surprise vote. The premier's remarks also come as the country's opposition leader, Antonis Samaras, called for Tsipras to scrap the referendum and form a government of national unity. A default on a 1.6 billion euro ($1.9 billion) debt due the International Monetary Fund on Tuesday could presage an exit from the eurozone and a return to a heavily devalued version of Greece's former currency, the drachma. As Joanna Kakissis reports from Athens for NPR: "Some European leaders say the Greek government closed the door on negotiations by calling a referendum. Others are pushing for a compromise to preserve the euro." "The central bank's 25-member governing council, convened by conference call, was discussing how and whether to extend an emergency line of credit — currently worth more than 85 billion euros, or $95 billion — that in recent weeks has kept Greek banks from collapsing. "Analysts say that without these funds, Greek banks would not have sufficient money to provide to panicky savers if they opened on Monday. Without a continued flow of money to consumers and businesses, Greece's struggling economy would probably lapse deeper into recession." U.S. Treasury Secretary Jack Lew called IMF Managing Director Christine Lagarde and the finance ministers of Germany and France, urging them to "find a solution that puts Greece on a path toward reform and recovery within the Eurozone," according to a statement.